Hildegarde Hannum received a Ph.D. in German language and literature from Harvard, with a dissertation about the concept of the will in the early fiction of Thomas Mann. After teaching German language and literature at Hayward State University, UC Berkeley, and Connecticut College, she turned to a career as free-lance translator from German to English with her husband Hunter; their translations include works by Erich Fromm, Arno Gruen, Hans Jonas, and Alice Miller. 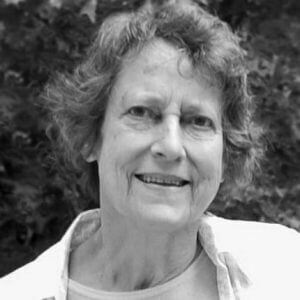 A board member since 1982, Hildegarde edits the Annual E. F. Schumacher Lectures, turning the spoken word into essays that are published in pamphlet form and are available online. She also edited People, Land, and Community: Collected E. F. Schumacher Society Lectures (Yale University Press, 1997). While in California during the 1960s she joined protests against the war in Vietnam, and in 2003 in Connecticut she vigiled against invading Iraq. In the early 1980s she was an active member of the Connecticut Nuclear Arms Freeze Campaign as part of a committee representing the town of Old Lyme. In the 1990s she co-founded Energy Options, a local organization with the purpose of considering ways to reduce our reliance on fossil fuels and nuclear power through increased use of renewable sources of energy in combination with energy efficiency.